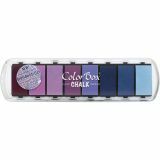 ColorBox Fluid Chalk Paintbox Option Ink Pad 8 Colors - CLEARSNAP-Colorbox Fluid Chalk Paintbox Option. Fluid Chalk inks share the resilience of pigment ink but stamp and blend like dye ink, drying quickly on absorbent surfaces. They are permanent when heat set and they resist smearing, bleeding, or fading even when air dried. The Option Pad design offers crafters a variety of color in one purchase. Each plate lifts out individually so you can apply ink precisely where needed. This package contains eight 1-5/8x7/8in inkpads in a stackable case. Available in a variety of color combinations: each sold separately. Case measures 9x2-1/2x1in. Conforms to ASTM D 4236. Made in USA.